Medical training is dotted with a series of milestones that we dread until the moment they arrive and look back on with some degree of bittersweet nostalgia. I am now happily in my third year of medical school and done with the dreaded USMLE Step 1. 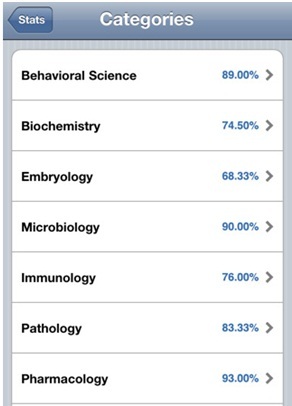 One of the apps that helped me get here was First Aid Q&A for the USMLE Step 1, by Modality, Inc. The First Aid series is one of the most trusted resources among medical students. Published by McGraw-Hill and written/edited by a group of physicians and medical students, it is a great resource. As an app, it costs $44.99, almost exactly the same price as the book of the same name. Here, we look to see if it is just as valuable. Upon entering the app, users are greeted with the welcome screen (above). From here, you can create a new quiz, view saved quizzes, use the question browser, or view your cumulative stats. My favorite feature was the question browser. Here you can answer questions by topic and receive feedback and explanations immediately. Answering questions is easy and simple – select your answer choice with one tap, then tap “Check Answer.” The app will instantaneously inform you if your answer is correct or incorrect. 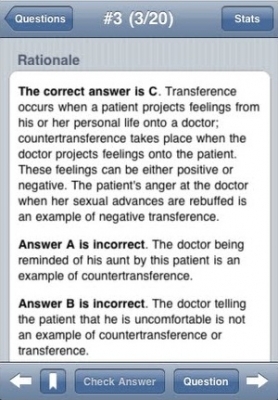 From there, you can view the rationale for the correct answer. Unfortunately, your answers are not saved in question browser mode, so the questions you do here are not recorded in your stats. The question browser also has an option for “reference mode,” in which correct answers are automatically displayed. In quiz mode, you can create a custom timed quiz for yourself. This mode allows you to select topics you wish to be included in your quiz and set the number of questions in the quiz as well (up to 50 at a time). The timer, visible in the upper right-hand corner, gives you one minute per question, which is slightly less time than you will receive on the actual Step 1 exam. Your scores from these quizzes will be recorded in your cumulative stats. 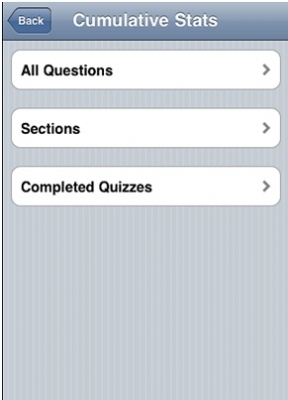 You may also take one of seven pre-set timed quizzes in quiz mode. Each quiz contains 48 questions different from the ones available by topic, providing you with an additional 336 practice questions. Finally, you can easily monitor your performance right within the app. Performance statistics can be viewed by subject section, completed quizzes, or all questions answered, allowing you to assess your strengths and weaknesses with just a few taps. Overall, this app makes USMLE Step 1 preparation faster and easier for busy students. No need to carry around another book! Friendly user interface and easy navigation within the app. Instant feedback and explanations –no need to keep flipping to the back of a book or calculating your own percentages. Ability to bookmark questions that you wish to return to at a later time. Automatically records your performance statistics. Recent update requires an Epocrates login to use the app. Impossible to annotate questions, explanations, or cross out answer choices. Though the price of the app is approximately the same as the list price of the book, the text may be purchased at a significantly lower price online. This app allows students to answer questions and receive feedback quickly, without the inconvenience of having to flip back and forth in a book. It is also a great choice for students on the go, who can answer questions on their iPhones whenever they have a few spare minutes. If you’re a student that needs to highlight, underline, and mark out answer choices while answering questions, this may not be ideal for you, as annotations are not currently possible. However, its ease of use made it one of my favorite study tools, and I found it highly useful.